Learn more about Ophthalmic diagnosis, care, and treatments with this comprehensive encyclopedia. Coat’s Disease is also called congenital telangiectasia. It is related to type 1 macular telangiectasia, since it involves localized dilations, or aneurysms, of blood vessels throughout the retina. Leber’s Miliary Aneurysm is an interchangeable term for the mildest form of Coat’s Disease; the mild form often involves no vision loss and no exudates. In more severe forms, the aneurysms bleed into the back of the eye, and cholesterol from the leaking blood is left behind on the retinal cells. Coat’s Disease is similar to type 1 macular telangiectasia because it usually affects only one eye and usually occurs in males. The difference is that Coat’s Disease is present at birth and is very often diagnosed in early childhood. Some researchers have suggested that Coat’s Disease may be caused by a genetic mutation, but this is not known for certain. Coat’s Disease, in its more severe form, causes a gradual deterioration of vision and often results in retinal detachment. The progression of Coat’s Disease can sometimes be stopped by laser surgery or cryotherapy. These treatments can not be used if the capillaries affected are near the optic nerve, or it Coat’s Disease has progressed too far. Few children with Coat’s Disease are diagnosed at a stage at which surgery or cryotherapy can stop the progression of the disease because they are often too young to explain the symptoms of the disease or describe their vision loss. In addition to retinal detachment, glaucoma, atrophy, or cataracts may occur as Coat’s Disease progresses. Unfortunately, removal of the affected eye may be an eventual outcome. A diagnosis of Coat’s Disease can be frightening and devastating—for both the child who has received the diagnosis and his parent. It is important for a parent to try to maintain an optimistic attitude and encourage his or her child to adapt to vision loss by relying on— and protecting—the non-Coat’s eye. Central serous chorioretinopathy (CSC) occurs when fluid collects between the photoreceptor layer and the pigment epithelial layer of the retina. The exact reason for the collection of fluid in the subretinal space is not well understood. It is known that most individuals who develop CSC are young adult males, and many live a high-stress lifestyle. This has lead researchers to believe that there may be a link between CSC and the stress hormones epinephrine and cortisol. The accumulation of fluid under the retina causes blurriness and distortion in the center of vision. Often, the accumulation of fluid will cause a serous pigment epithelial detachment, causing even more fluid to leak into the subretinal space. Laser photocoagulation is sometimes used if there are areas that are allowing fluid to leak into the space, but it is a controversial treatment. Left untreated, CSC will often resolve itself, and most vision will be restored within six months. Central vision may remain slightly distorted, and night vision may be reduced. People who have experienced CSC should be aware that recurrences sometimes occur. This type of occlusion occurs when a small branch retinal artery becomes blocked or clogged. Within the arteries of the retina, occlusions most often occur due to a clot that originates from another vessel in the body and finally lodges in a small branch retinal artery. When an occlusion occurs in a branch retinal artery, a small area of cells in the retina is deprived of oxygen. In occlusions that occur in branch retinal arteries, the affected cells most certainly die. Retinal artery occlusions occur suddenly, causing immediate and noticeable decreased vision in one eye. The vision loss is usually permanent, but often not as drastic as what occurs when the central retinal artery becomes blocked. There are ways to lessen the chance that a future occlusion will occur. Most people who have an occlusion in an artery of the retina have high blood pressure, high cholesterol, or some form of vessel disease. When proper steps are taken to control blood pressure, cholesterol, and blood sugar, the occurrence of another occlusion is much less likely. Best’s disease is a disease categorized as a hereditary chorioretinal dystrophy. It is a rare, genetic disease that is characterized by a large, yellow protein that forms under the retinal pigment epithelium (RPE) in the area of the macula. Inherited eye conditions usually present themselves early in life. Best’s disease is usually diagnosed during childhood, but the onset and severity of symptoms varies. Often, the large, fluid-filled drusen (resembling an egg yolk) beneath the RPE does not affect vision. Eventually, though, this drusen will rupture, and fluid and protein molecules will spread beneath the retina. Central vision will become worse over time, but not to the point of blindness. Best’s disease cannot be cured, but it is possible to adapt quite well to limited vision. Peripheral vision will not be affected, and one eye will often retain good central vision. Only one copy of the gene responsible for Best’s disease is needed to cause its expression. Therefore, if one parent has the condition, there is a 50/50 chance that a child will inherit the disease. A similar form of Best’s disease that occurs later in life, and whose pattern of inheritance is unknown, is Adult Vitelliform Macular Degeneration. Basal laminar drusen are small, round, uniformly sized, yellow drusen (accumulations of extracellular material that build up in the eye) scattered in clusters between the pigment epithelial layer and the bottom-most Bruch’s membrane of the retina. Imaging technologies such as fluorescein angiography (FA) depict basal laminar drusen as appearing in a “starry sky” pattern. Basal laminar drusen often are seen in conjunction with a pseudovitelliform detachment of the macula. Alone, these kind of drusen have little or no effect on vision. It is common for the macula to break down as one ages. Sometimes, the deterioration of the macula, as well as a predilection to risk factors such as heredity, race (whites are more susceptible than people of darker pigment), smoking, or a high-fat, low-antioxidant diet leads to Age-related Macular Degeneration (AMD). Neovascular AMD describes the formation of new fragile capillaries in response to extensive damage and breakage of the pigment epithelial layer of the macula. Damage to this thin, mesh-like layer of capillaries may occur because of the presence of drusen or because of fluid accumulating in the sub-retinal space between the two layers. Instead of forming in an organized fashion, the new blood vessels messily make their way into sensory layers of the macula. These new vessels often break as well, and along with the broken vascular layer, destroy the healthy macula. Most, but not all, people with wet AMD have neovascular AMD. Combined, wet AMD and neovascular AMD account for only 10% of all cases of AMD. Unfortunately, these cases also account for the most severe loss of vision. For both groups, leakage of blood and other fluids into the macula causes extreme blurriness and even dark “blobs” in the center of vision. Over time, reading and other pastimes requiring detailed, straight-ahead vision will be affected. However, total blindness does not normally occur, since AMD only affects central vision. 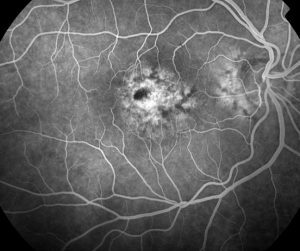 Technologies like fluorescein angiography (FA), indocyanine green (ICG) imaging, and ocular coherence tomography (OCT) are able to determine where new blood vessels are wildly and uncontrollably proliferating. The location determines the type of neovascularization and is also the determining factor for treatment. There are a number of very effective treatments available, mostly targeting the new blood vessels that form in response to the broken layer between the retina and the choroid. There are currently three anti-vegf agents, Macugen (pegaptanib), Lucentis (ranibizumab), and Avastin (bevacizumab), that are used to prevent new, fragile blood vessels from growing back. Additionally, laser photocoagulation and photodynamic therapy work in slightly different ways to seal off broken vessels or destroy new, unhealthy ones. Adult Vitelliform Macular Dystrophy is closely related to Best’s disease. One out of four people with the adult-onset form of this disease has a genetic mutation that causes a fatty, yellow, fluid-filled protein to form beneath the pigment epithelial layer of the retina. In three out of four cases, there is no genetic mutation, and the exact cause for the protein formation is unknown. In any case, the fluid-filled drusen will eventually rupture, and straight-ahead vision will slowly begin to worsen. Adult vitelliform macular dystrophy cannot be cured, but it is possible to adapt quite well to limited vision. Side (peripheral) vision and night vision will not be affected. This is because the disease affects the macula, and the macula is packed with cones. Rods, the photoreceptors of the retina that enable vision in conditions of low light, are not affected. The lens is a dense, transparent structure made of proteins, located just behind the iris and pupil. Its curvature and density cause light waves to bend as they travel through the lens. After passing through the lens, the light waves converge and project an inverted image on the retina. The retina changes the light waves to electric impulses that then travel along the optic nerve to the brain. This entire series of events results in a visual and understandable representation of light and color. The lens also changes shape in order to focus on objects at various distances. The older one becomes, the stiffer and more inflexible the lens becomes. Oftentimes, the lens becomes so stiff that it cannot change its shape sufficiently to accommodate both images of objects up close and far away. This is why the need for bifocals or reading glasses are common as people age. New, thin layers continually grow over old layers of the lens. These layers of cells grow inward from the edges but never form in the center of the lens. If the cells at the center of the lens grow cloudy, cataracts develop. Natural lenses can be replaced with artificial lenses in a relatively fast and easy surgical procedure, making cataracts an easily treatable disease. The vitreous is a clear, gel-like substance that fills the area between the lens and the retina. The pressure of the vitreous allows the eye to hold its shape. It also keeps structures like the retina in place. With age, the composition of the vitreous changes. It may liquefy, allowing small bits of debris to float freely. Sometimes, miniscule collagen fibers clump together within the vitreous. Both create black, spidery flecks called floaters seen in the field of vision. Floaters are generally harmless but will remain within the vitreous unless surgically removed. The changing composition of the vitreous may also cause it to pull on the retina, sometimes resulting in a macular hole or a detached retina. The two types of light-sensitive cells of the retina are rods and cones. 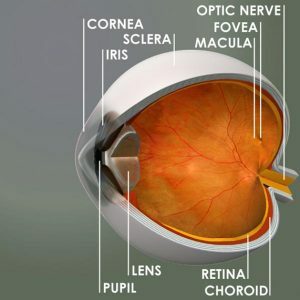 Named because of their cylindrical shape, rods are interspersed throughout the retina. They are highly sensitive to low light and shadow and allow for at least some degree of nighttime vision. Cones are present throughout the retina also, but are very highly concentrated in the fovea of the macula. Different cones are sensitive to different wavelengths and allow one to see vivid colors and sharp detail in conditions of bright light. There are 20 times more rods than cones. The opening at the center of the iris through which light enters the eye. The iris causes the pupil to dilate and contract in response to stimuli such as light, extreme emotion, and certain drugs. The pupil is in direct line with the macula, allowing light to be concentrated where vision is clearest. The iris will contract the pupil in conditions of bright light and will widen the pupil in low light in order to optimize vision. The choroid is the nourishing layer of the eye located between the retina and the sclera, and is filled with tiny blood vessels. The choroid supplies the outer layer of the retina with blood. In the womb, the choroid gives rise to all other structures of the eye. At the back of the eye, directly in line with the pupil, is an area of the retina called the macula. In the center of the macula is an indentation called the fovea that is packed with cones, cells that require high levels of light in order to function. As light enters the eye through the pupil, it is concentrated into the area of the macula and the fovea. Because of the cones that comprise the macula, central vision is crisp, clear, detailed and in color. The macula, an area just 5mm in diameter (roughly the thickness of a fingernail), is responsible for the vision that is necessary for many daily activities. Any condition that impairs this area will adversely affect central vision and the ability to carry out many activities that are important to daily life. The white, fibrous, protective outer layer of the eye, composed primarily of collagen and elastic fibers. The sclera varies in thinkness from about 0.3 mm to 1 mm, and is covered by a thin layer of tinnue called the conjunctiva. In ophthalmology, the fundus describes the back interior surface of the eye, opposite the lens, and includes the anatomical structures of the retina, optic disc, macula and fovea. An occlusion is a blockage that occurs in a blood vessel as a result of debris in the bloodstream, inflammation, or high blood pressure. Within the veins of the retina, occlusions most often occur due to high blood pressure or high intra-ocular pressure and at a point where arteries and veins cross over each other. A blockage may occur in the main vein of the retina or in any of the smaller veins that branch off from it. When an occlusion occurs, the veins of the retina cannot drain properly. This prevents the retinal cells in the area from receiving a fresh supply of oxygen- and nutrient-rich blood. Deprived of oxygen and nutrients, the affected cells cannot function properly and may even die. Perhaps more destructive is the hemorrhage of vessels that occurs because the backed-up blood has nowhere to go. The surrounding retinal tissue then succumbs to edema and swelling. Occlusions occur suddenly, causing decreased vision in one eye that will vary from mild to severe. In most cases, complete vision cannot be restored, but lasers can treat any persisting edema and the related bleeding from burst blood vessels. Laser treatment can improve vision significantly. In addition, the FDA is expected to approve Lucentis, an anti-vegf injectable medication used for the treatment of wet AMD, for use in treating branch retinal vein occlusions sometime in late 2010. Anti-vegf agents inhibit the growth of new blood vessels from damaged tissue and play a role in preventing vessels from leaking. Laser photocoagulation is a treatment most often used for diabetic retinopathy that uses a laser to seal leaking blood vessels. During later stages of diabetic retinopathy, abnormal blood vessels grow in response to damage within the retina. These new capillaries are weak and will often break, leak, or burst. When this happens, sudden and severe vision loss can occur. During laser photocoagulation, a laser is used to direct intense, focused rays of light through the transparent structures of the eye to the retina. The laser will burn, or coagulate, the tissues around the abnormal blood vessels, destroying the blood vessels and scarring the tissues so that new blood vessel growth cannot occur. The laser is not directed toward the macula, the area responsible for clear, distinct, straight-ahead vision, as it would destroy sight. 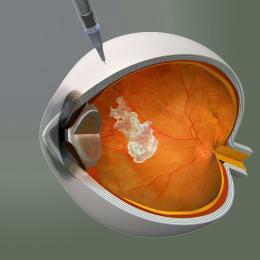 Vision is preserved using this procedure but is not restored. Treatment is usually a short, painless, and relatively easy process, done in the doctor’s office, and does not require hospitalization. Laser photocoagulation is sometimes used to treat type 2 neovascularization and central serous chorioretinopathy, as well as for detached retinas. The image below shows how laser light is focused on to specific areas of the retina using a "contact lens" held by the doctor. Diagrams and descriptions of the parts of the eye. Our eyes allow us to perceive light, dark, and color in astonishing detail, revealing the beauty and complexity of the world around us. Perhaps even more extraordinary is the fact that this organ of vision measures just 24mm (0.95 inches) and weighs 7.5 grams (0.25 ounces)! The eye's many complex structures, some more obvious than others, are mostly unknown outside of the medical field. In an attempt to eliminate any mysteries, our encyclopedia offers easy to understand definitions of most of the terms you're likely to hear in your ophthalmologist's office, and cross-references them with other relevant terms when appropriate. Unfortunately, as with the rest of our body, there are many diseases that can effect our eyes. Most are obscure and exotic, and few of us will ever experience them outside of medical textbooks. There are, however, a small handful of diseases that are part of the common experience. We list most of them here along with consice definitions and relevant information so that you can be better informed. Whether it's you or it's a loved one is experiencing eye problems, you owe it to yourself to be better informed. As with any specialized area of study, ophthalmology has its own complex array of terminology, machinery, and processes. This section of the encyclopedia gives insight into some of the "tools of the trade", describing most of the unique technologies you might encounter if you spent a lot of time at your ophthalmologist's office. This section of the encyclopedia is intended to let you know what treatments may be available for various ophthalmic disorders, and to shed light on what each involves. If your ophthalmologist is recommending a particular treatment, you should consider this a starting point for a deeper conversation about what your particular case may involve, as everyone has slightly different specific requirements. At this time, there is no way to prevent or cure either the dry (atrophic) or wet (neovascular) form of macular degeneration. However, significant progress has been made in treating the condition, and a great deal of research is currently under way. The most significant advance has been the development of a new class of drugs now being used to treat wet macular degeneration. The drugs are based on the discovery that a group of proteins in the body, called vascular endothelial growth factor (VEGF), play a significant role in the formation of the abnormal blood vessels that damage the retina in wet macular degeneration. These abnormal blood vessels are called choroidal neovascularization (CNV). The anti-VEGF drugs are injected directly into the jelly-like substance that fills the back of the eye, which is called the vitreous. Before the injection, drops are used to numb the eye and a speculum may be put in place to hold the eyelids out of the way. While it may seem scary to receive an injection into the eye, most patients find that they experience minimal discomfort. Once inside the eye, the medication diffuses throughout the retina and choroid. It binds strongly to the abnormal VEGF proteins, preventing the proteins from stimulating further unwanted blood vessel growth and leakage. Before injection of an anti-vascular endothelial growth factor (VEGF) drug, the eye is numbed and a speculum may be put in place to keep the eyelids out of the way. Two anti-VEGF drugs have been approved by the U.S. Food and Drug Administration (FDA) for the treatment of wet macular degeneration. The one most widely used is Lucentis (ranibizumab). In the studies that evaluated Lucentis, the results were more favorable than for any other previously FDA approved treatment. Instead of only slowing the rate of vision loss, the drug appeared to stop disease progression in most people for as long as two years. Also, many patients in the study gained a small amount of vision, and some experienced significant improvement. It is important to note that the patients in the study had fairly recently diagnosed macular degeneration that had not yet progressed to scarring. Each person responds differently to treatment, depending on his or her individual situation. In the studies of Lucentis, patients were given injections every month for up to two years. More recent evidence suggests that it may be possible to obtain similar results by giving several injections at monthly intervals and then increasing the time between subsequent injections. Retinal specialists are still investigating the optimal timing of injections. Also, research is under way to develop other methods of delivering drugs to the eye to reduce the need for frequent injections. The first anti-VEGF drug to be approved by the FDA for the treatment of wet macular degeneration was Macugen (pegaptanib sodium). It works in a similar manner to Lucentis, but is not as effective. This is most likely because it acts against only one form of the VEGF protein, called VEGF-165, whereas Lucentis targets all forms of VEGF. In theory, if Lucentis from the eye were to travel to other parts of the body and interfere with VEGF, it could lead to problems, such as an increased risk of heart attack or stroke. However, the amount of drug injected is small, and no safety problems have emerged with the use of Lucentis. Your ophthalmologist will explain the advantages and disadvantages of all available treatments for wet macular degeneration and choose your treatment based on your individual case. The FDA-approved anti-VEGF drugs are costly, but the pharmaceutical companies that make them offer assistance programs for patients who qualify. Ask your ophthalmologist for information about these programs. Photodynamic therapy (PDT) is a treatment used to destroy broken or newly forming abnormal blood vessels associated with wet AMD. It uses a drug called verteporfin that is activated by a bright laser light. Verteporfin is injected into the arm and travels throughout the body. It tends to stick to and accumulate in new blood vessels. 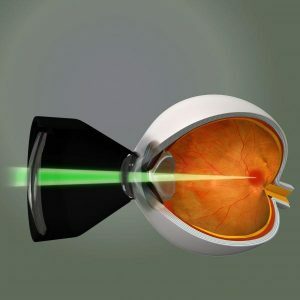 After enough time has elapsed to allow the drug to travel to the vessels of the eye, a laser light is shined directly into it. The intense light from the laser activates the drug, which destroys the abnormal blood vessels without harming the surrounding tissue. PDT is often used in combination with Lucentis or another anti-vegf agent. The procedure will be repeated if new abnormal blood vessels form. PLEASE NOTE: Because the drug temporarily sensitizes the skin to sunlight, patients are required to wear protective clothing (sunglasses, hat, long-sleeved shirt and pants, gloves) when outside until it wears off. 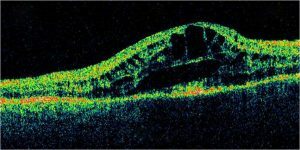 Optical Coherence Tomography (OCT) is, perhaps, the most promising technology available to produce images of the eye. 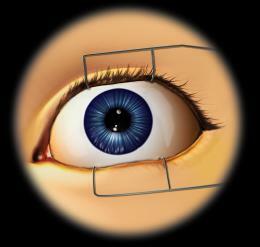 During the simple procedure, a laser quickly scans the dilated eye. 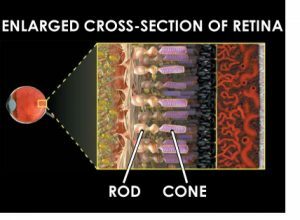 Unlike other imaging methods, such as ICG and FA, which produce top views of the retina, the image produced is a cross-section of the layers of the retina. Each of the thin layers of photoreceptors, nerve cells, and pigment epithelial cells are clearly delineated. A high-quality image will show where abnormalities have occurred, such as the formation of drusen or new blood vessels, or the detachment or breakage of any of the retinal layers. OCT is an important tool for the diagnosis and treatment of many retinal conditions. Below is an OCT showing a cross-section of the retina, revealing pockets of fluid (the dark areas "sandwiched" between the green layers of retina) under the surface. Indocyanine Green (ICG) Imaging is similar to fluorescein angiography (FA). Like FA, it is a useful tool for the diagnosis and treatment of several forms of macular degeneration and retinopathy. It is more effective than FA in producing images of blood vessel growth and damage in the deeper choroid layer behind the retina. It is also able to produce a better image than FA if blood is present in the macula. The process is generally safe, with a minimum of discomfort, and is usually done in the doctor’s office. It involves dilating the eyes being photographed, and an injection of the green dye, usually in the arm, which circulates throughout the body, including the choroidal layer of the eye. A flash illuminates the eye and the resulting images are stored on a digital camera system. The fluorescent light that the indocyanine green dye emits can help to identify abnormalities in the circulation of the choroid. A series of images, or a movie of the dye moving through the vessels of the choroid, will help the ophthalmologist to decide upon the best treatment to prevent further vision loss. Most ophthalmologists consider ICG angiography to be an adjunctive or secondary test which adds further information to the clinical picture, and is often done in addition to a fluorescein angiogram. Below is an example of a typical Indocyanine Green angiogram, revealing an area of leakage (the bright area) just outside the macula in the center of the image. The optic nerve can be seen to the left. Fluorescein angiography (FA) is a technology that allows photographs of the blood vessels of the retina to be taken. It is a useful tool for the diagnosis and treatment of several forms of macular degeneration and retinopathy as well as other disorders. The process involves injecting the dye into a vein in the arm, just after the eyes have been dilated with eye drops. The yellow dye will travel throughout the bloodstream, including the vessels of the retina. It will fluoresce, or emit light, when an extremely bright light is flashed into the eyes. A series of photographs will show the entrance and exit of the dye through the blood vessels of the retina and just beneath it. 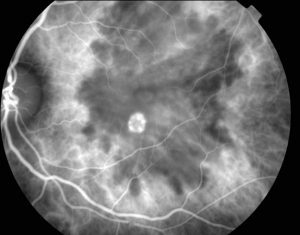 Any areas of abnormal new blood vessel growth, leakage, or blockage, will appear darker or brighter than normal angiograms of the vascular retinal area. The process is generally safe, with a minimum of discomfort, and is usually done in the doctor’s office. It is an important tool, because it will reveal the location of damage by leaking or pooled blood and will show where new blood vessel growth is occurring. This will help the ophthalmologist to decide upon the best treatment to prevent further vision loss. Below is a typical flourescein angiogram showing an eye with leaking vessels (the bright area) in the middle of the macula. The optic nerve is seen to the right. The Amsler grid is a simple square chart with a dot in the middle of what resembles graph paper, and can be used to test ones central visual field while at home. The lines are usually black, and the background white, though sometimes the colors are reversed. The test is a diagnostic tool that aids in the detection of visual disturbances caused by changes in the retina, particularly the macula (e.g. macular degeneration, Epiretinal membrane), as well as the optic nerve and the visual pathway to the brain. 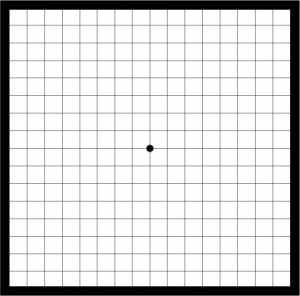 When taking the test, the patient will be asked to look at the grid and concentrate on the dot in the middle, using one eye at a time. If the lines near the dot appear wavy, blurred, or are missing, macular degeneration, and the loss of central vision, may be occurring. The distorted image of the grid is not an optical illusion but is evidence that some photosensitive cells in the macula may have been destroyed, obscured (usually by blood) or displaced (as in a retinal detachment). Cataracts are the opaque, or milky, areas that can form in part or all of the crystaline lens of the eye. They often start with only a slight disturbance of normal vision, often going unnoticed for years, and can slowly increase in opacity until they completely interfere with vision. Some of the early effects of a cataract are a decrease in contrast sensitivity and color intensity, but eventually they also decrease visual acuity. There are many possible reasons for developing a catartact, including age, excess exposure to ultraviolet light and radiation, physical trauma to the eye, secondary effects of diseases such as diabetes or hypertension, and the side effects of certain drugs such as corticosteroids. There may also be a genetic component to certain forms of cataracts. Cataracts are classified by a number of terms that include: partial, complete, hard, soft, stationary or progressive, nuclear, cortical, mature, and hypermature. They may also be classified as being posterior or anterior, referring to thier location. Surgery ro remove "mature" cataracts is common and is often performed with only a local anaesthetic on an outpatient basis, allowing the patient to go home the same day. The surgery removes the old lens and replaces it with a plastic one, referred to as an intraocular lens, or IOL. Endophthalmitis and retinal detachment are some of the possible complications of cataract surgery. The wet, exudative form of AMD occurs when the pigment epithelial layer of the macula, located just behind the layer of cells responsible for central vision, sustains such damage that it breaks. Damage to this thin, mesh-like layer of capillaries may occur because of the presence of drusen or because of fluid accumulating in the sub-retinal space between the two layers. When the pigment epithelial layer breaks, blood leaks into the photoreceptor layer. In most people, new but very fragile capillaries begin to grow back from the broken membrane, and the condition is further classified as neovascular AMD. Instead of forming in an organized fashion, these new blood vessels messily make their way into other layers of the macula like unruly tendrils of a vine. These new vessels often break as well, and along with the broken vascular layer, destroy the healthy macula. Combined, wet AMD and neovascular AMD account for only 10% of all cases of AMD. Unfortunately, these cases also account for the most severe loss of vision. For both groups, leakage of blood and other fluids into the macula causes extreme blurriness and even dark “blobs” in the center of vision. Over time, reading and other pastimes requiring detailed, straight-ahead vision will be affected. However, total blindness does not normally occur, since AMD does not affect peripheral vision. The upside of wet and neovascularized AMD is that there are a number of very effective treatments available, mostly targeting the new blood vessels that form in response to the broken layer between the retina and the choroid. There are currently four anti-vegf agents, Macugen (pegaptanib), Lucentis (ranibizumab), Avastin (bevacizumab), and Eylea (aflibercept) that are used to prevent new, fragile blood vessels from growing back. Additionally, laser photocoagulation and photodynamic therapy work in slightly different ways to seal off broken vessels or destroy new, unhealthy ones. The macula deteriorates as one ages. Sometimes, the deterioration of the macula, as well as a predilection to risk factors such as heredity, race (whites are more susceptible to the condition than people of darker pigment), smoking, or a high-fat, low-antioxidant diet leads to age-related macular degeneration (AMD). The dry form of AMD occurs when yellow deposits called drusen form behind the retina. The larger or more prolific these drusen are, the more damage they cause to the pigment epithelial layer of the macula. This layer is directly behind the photoreceptor layer of the macula and provides the sensory cells with an oxygen- and nutrient-rich blood supply. Nearly a quarter of people aged 65 to 74 develop age-related macular degeneration. One out of every three people aged 75 or older is afflicted with the disease. Dry AMD is the most common form of AMD. People with the very early stages of dry AMD rarely experience any noticeable vision problems, but when the pigment epithelial layer sustains damage, central vision loss occurs. AMD is not painful, though the vision loss it causes can be frustrating. The macula allows one to have crisp, clear central vision. Its break down causes images in the direct line of sight to lose their sharpness. Central vision will become blurred, and over time the ability to perform some activities of daily living and enjoy some common pastimes will be affected. For example, reading and the ability to recognize faces may become difficult. However, total blindness does not normally occur, since AMD does not affect peripheral vision. There is not a cure for dry AMD, but a specific multi-vitamin and mineral supplement has been found effective in stopping the conversion of the disease from the dry form to the more serious neovascular form of AMD. The supplement, formulated after the release of results from the AREDS 2 study (Age-Related Eye Disease Study), is a combination of anti-oxidants and vitamins that are known to contribute to blood vessel integrity, thus preventing weakened blood vessels from bleeding, breaking, or bursting. The supplement should only be taken under a medical professional’s guidance. 1 in 10,000 people has Stargardt’s disease. It is an inherited disease that is sometimes, but not always, characterized by the distribution of yellow “flecks” throughout the fundus, or back wall, of the eye and a rapidly progressive loss of central vision. Inherited eye conditions usually present themselves early in life. The symptoms of Stargardt’s disease typically occur between seven and 12 years of age. When Stargardt’s disease develops in adulthood, it is sometimes referred to instead as fundus flavimaculatus (FFM), which is a subtype of Stargardt’s disease. In most cases of Stargardt’s and FFM, yellow deposits of a protein called lipofuscein are scattered throughout the macula. The subsequent scarring and deterioriation of the macula result in central vision loss that may progress quickly or over many years. Half of those with Stargardt’s disease are legally blind by the age of 50, but some peripheral vision remains intact. There is no standard treatment for Stargardt’s disease, but low-vision aids can help an individual to retain the ability to perform some work-related and daily activities. Some forms of Stargardt’s disease are inherited from a parent who has the disease, but Stargardt’s disease can also appear in the child of parents who have normal retinas and no vision problems. This happens because the defective gene that causes Stargardt’s disease is recessive; it will not be physically expressed unless the other of the pair is also recessive. A parent with normal vision can carry the gene for Stargardt’s disease, but it is inactive. When two parents carry the inactive gene, there is a one in four chance that the two recessive genes will pair-up, and Stargardt’s disease will be expressed. Genetic counseling can be very helpful in family planning, both for parents of a child with Stargardt’s disease who are considering having more children, and for an adult with Stargardt’s disease who would like to start a family. A serous pigment epithelial detachment occurs when the sensory retina detaches from the pigment epithelial layer due to inflammation, injury, or vascular abnormalities. A serous pigment epithelial detachment often occurs in conjunction with central serous chorioretinopathy. This is because of the fluid that accumulates in the subretinal space. Serous pigment epithelial detachments occur in people of all ages. They are most often associated with retinopathy or other retinal diseases. Sudden vision changes such as floaters, blurry or distorted central vision, flashes of light, or “shadows” that sweep inward from the periphery might indicate a retinal detachment. Retinal detachments require surgery. Left untreated, the retina can detach completely and can cause blindness. However, there are several surgical options for retinal detachments, and all are highly successful. Laser photocoagulation is used to seal off tears or holes. Surgical procedures to re-attach the retina include scleral buckling, vitrectomy, and pneumatic retinopexy. It is important to know that even after the retina is successfully re-attached, vision may not be perfectly restored. A rhegmatogenous retinal detachment (RRD) occurs when the retina breaks, tears, or develops a hole. Fluid from the vitreous will then seep in through the tear or hole and cause the retina to detach from its pigment epithelial layer. RRD’s are more common than serous pigment epithelial detachments. They most often occur in the elderly, nearsighted, those who have an advanced stage of retinopathy or other retinal disease, those who have had cataract surgery, or those who have experienced trauma. Sudden vision changes such as floaters, blurry or distorted central vision, flashes of light, or “shadows” that sweep inward from the periphery might indicate a rhegmatogenous retinal detachment. Any change in the retina due to disease or damage is called a retinopathy. Some retinopathies are the result of underlying disease, such as diabetes or hypertension. Other retinopathies occur because of exposure to a toxin or an adverse reaction to something in the environment. Certain drugs, extreme bright sunlight, and even high altitude can cause retinopathy. Retinopathy may result in blurred vision or vision loss, due to the abnormal growth of capillaries in the retina and any leaking or hemorrhaging that occurs. In many cases, treatment of the underlying disease improves vision. Retinitis pigmentosa is one in a group of diseases classified as hereditary chorioretinal dystrophies. There are multiple forms of retinitis pigmentosa, each occurring as a result of a specific abnormal gene. The disease is inherited in a number of different ways. Genetic testing and counseling are very helpful in determining the form of the disease, how it has been inherited, and what treatments are available or are being researched. Retinitis pigmentosa is usually diagnosed during young adulthood and can be difficult to accept. Knowledge is power, and information about retinitis pigmentosa can empower a young adult to learn to live with this condition. In contrast to other chorioretinal dystrophies, retinitis pigmentosa results in the loss of night vision and peripheral vision first and will eventually affect central vision as well. During the progression of the disease, cellular malfunctions cause the destruction of rods, which are the photoreceptors responsible for vision in low light conditions. Rods are interspersed throughout the retina, which is why peripheral, or side, vision loss occurs. Vision loss will sweep inward, until only a small, central area of vision remains. Most people with retinitis pigmentosa are legally blind by 40 years of age. There is no cure for retinitis pigmentosa, but it is an area of promising research. Technology continues to improve upon low-vision aids. Gene therapies, delivery methods of agents to rods and cones, and the effects of vitamin A and DHA on the progression of the disease are currently being studied.